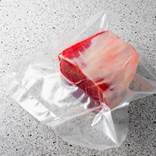 Vacuum packaging increases the shelf life of the food products from a factor of 3 to 5. For this purpose the packaging is first emptied and then hermetically sealed. Proper operation of the packaging machine should be checked regularly. Only when there is enough vacuum inside the package, the quality, freshness and nutrients and flavor of the product are fully preserved. The 81 series battery operated vacuum meter / logger with measuring range 1600 – 1 mbar (1200 – 1 Torr), is placed on the packaging machine at specified intervals and sealed in vacuum instead of the product. During the packaging process the medium stores the minimum pressure achieved. Then the vacuum gauge is removed from the packaging and the minimum pressure can be checked. The ideal gauge for performance testing of vacuum packaging systems and quality control of packaged products.